It's a wonderful moment. Abhiram Hens, ex-student from 2002 batch, received CSIR Young Scientist Award in 2018. 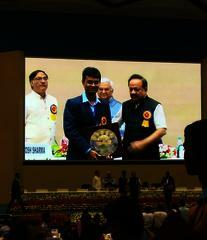 The award was delivered on the occasion of CSIR Foundation Day celebration at Science Centre, New Delhi. The Association congratulates Abhiram for his achievement.